On every rescue, I always hope for a cooperative cat, because that makes the rescue much easier on both me and the cat. Before the rescue, I always ask several questions of the cat owner to help me estimate how cooperative the cat will be. 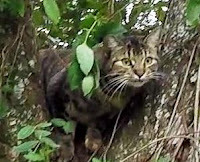 In Jem's case, I was told that she was a very sweet cat, but I never know for sure how any cat will react once I approach them in the tree. Jem, however, turned out to be a most cooperative cat -- almost too cooperative. On a scale from 1 to 10, Jem is a 10. 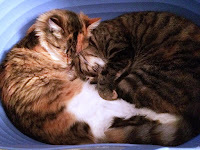 Jem, a gray tabby girl, is only 9 months old and lives in a nice home with her calico sister, Scout. Jem had been stuck in the next-door neighbor's tree for two nights before her owner, Lynn, was able to find me. Those two nights had been miserable ones, for both Jem and Lynn, as the weather had been cold and rainy. When Lynn called me on the morning of the third day, she was clearly distressed with the ordeal of trying to find someone to help her beloved Jem. Without making guarantees, I tried to reassure her that I would get her cat down. Shortly after talking to Lynn, she sent me a text message that the other cat, Scout, had climbed the tree next to Jem's and also appeared to be stuck. This was remarkable. 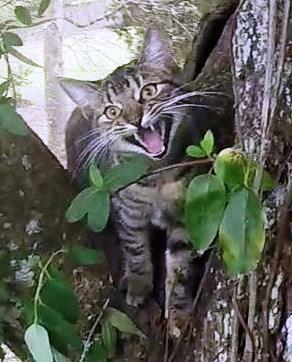 I have never had, or heard of, a double rescue of cats in adjacent trees, especially siblings. This was going to be a memorable day. By the time I arrived at the site, however, Scout had managed to come down, though no one saw how she did it. I was glad Scout was down, but also a little disappointed that the exceptional double rescue was no longer in play. Jem was only 25 feet high on the first branch of a very tall tree. Fortunately, she had stayed in that area the whole time, and while I prepared to climb up to her, she continued to stay in that same area. She was crying the whole time as if to say "Hurry up!" When I reached her, she continued to appear unafraid of me, so I reached out my hand to let her sniff. She was still comfortable with me, so I got closer to her. When I extended my hand to her again, she vigorously rubbed her face into it. She was clearly very happy to see me. Since she was so friendly, I would be able to hold her and gently put her inside a large bag for the trip down. As I was preparing the bag to put her in, Jem decided she could not wait any longer and walked onto my lap. She wanted to be sure she did not miss her opportunity to get out of this tree. After I got her settled on my lap, I finished preparing the bag while Jem decided she would crawl on top of my shoulder. Once the bag was ready, I picked Jem up off my shoulder and gently put her in the bag. In the video, most of this action occurs outside the frame of the camera because I never had time to point it further down. Jem and Scout are now both safely at home enjoying each other and the comforts of an indoor pampered life.